The Return of the King was the most overwrought piece of cinematography I've seen since the Matrix Reloaded. The Two Towers ended with a huge battle. The Return of the King picks up (after a short detour to Smeagal's Fateful Fishing Trip) with -- guess what -- another even bigger battle, followed by a minor skirmish, and finally the Mother of All Battles. You can't kill enough Orcs in these movies. They can always make more in Sauron's Evil Orc Factory. Amidst the waist deep black Orc blood are a few gems, however. Watch Legalos take down an animated menace all by his gorgeous self. Watch Eowyn find the fatal flaw in "No man can kill a Ring Wraith." Watch Karl Urban furl his brow like a misplaced Klingon. Watch the blondes; they do the real hero stuff. But there are more coals in this Christmas movie stocking than jewels. Yes, Frodo has a fetish for the Ring of Power. Everybody has issues with the Ring. We all know that. But was it really necessary to bring it up one more time for old time's sake at Sauron's BBQ pit? Each character's turn at obsessing over the Ring did nothing to deepen their tragic flaws or their resilience. Jackson blew his chance to make the Ring its own character. So get on with smelting the Cracker Jack prize, Hobbits. Frodo and Sam were so damned filthy I stopped caring about the Ring and rooted for them to get a bath. Gollum flounces about in nothing more than a scrappy thong and he's reasonably clean. What's up with that?? He's indestructible, too. Why he bounces off mountain sides with nary a scratch. Being an animated character means you never have to use deordorant or say you're sorry. Finally, Sam should have married Frodo and lived happily ever after in the Shire. Anyone with eyes to see could tell his marriage to the bar wench was a complete sham. There are a number of additional battle scenes, including several more of Eowyn and Merry fighting. Saruman's fate plays out in a terrific sequence near the beginning. The scene in the White Mountains with Aragon, Legolas, Gimli and the dead warriors who eventually agree to help Aragon culminates in a suspenseful action sequence we never saw in the theatre. I was particularly happy that they put back in there the confrontation between Gandalf and the Witch King. It's one of the most edge-of-your-seat moments in the books but never made it to the theatrical version. There's a scene with Aragon in which he reveals himself to Sauron through one of the seeing stones. There are a couple of scenes from the House of Healing where Aragon attends to the wounded Eowyn after the batttle at Pelenor and she later meets Faramir. There's a whole sequence of Sam and Frodo being forced to march with Sauron's army when they're mistaken for Orcs in their orc uniforms near the end. There's a nice scene between Pippin and Faramir which establishes their friendship and makes Pippin's determination to save him later on make more sense. Lots more. Seeing these scenes really gives you an admiration for the quality of the film making and the editing. The scenes are often just as good as those that made it to the theatrical version - the editors just needed to make REALLY hard choices to keep the movie at an acceptable running time for theatres. The extra features alone are worth the price of this extended package. There are a zillion little documentaries covering just about every aspect of the production - the sound, the art design, the editing, the script writing, the animation and model design at Weta, the music. XWP fans get to see the very talented Ngila Dickson talking about how she went about getting the ideas for the various costumes. There's an excellent documentary about Tolkien which discusses the writer's life and how his experiences in World War I, his marriage, his friendships all made their way into Middle-Earth. One of my favorite documentaries looks at the many horses used in the trilogy and shows how both the animals and the actors were trained. Most of the main horses used were eventually sold at the end of production and the actors and crew ended up buying several of them after having established such closed bonds. There's also a very nostalgic documentary which looks at the final days of post-production, at the various premieres and the night at the Academy Awards during which the film garnered its 11 Oscars. I was happy to see this film win so many Academy Awards but I have to say - particularly after seeing this extended version - that I think they got robbed by not receiving any acting nominations except for Ian's in the first film. The cast was spectacular. I especially think Bernard Hill (Theoden), Miranda Otto (Eowyn), Sean Astin (Sam), Elijah Wood (Frodo) and Viggo Mortenssen (Aragorn) deserved nominations along with Ian. Tons of commentary by everyone involved in the films is included. By far the most HISTERICAL is that provided by the actors - particularly Viggo, Billy Boyd (Pippin) and Dominic Monaghan (Merry). Also quite funny are the interviews with the staff from Weta most of whom would come out of meetings with Peter Jackson in shock at what they were being asked to do - Jackson kept wanting scenes to be bigger and bigger and bigger. It's clear by the time you finish watching all 4 discs that this trilogy was an epic experience both on screen and off and that those involved forged relationships just as strong and life-changing as those of the characters. 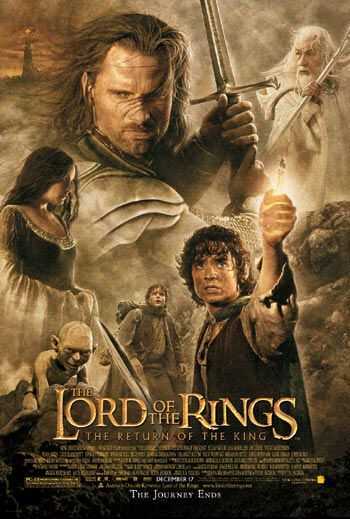 This is by far one of the finest DVDs I've ever seen - offering not only an extended version of the film but a different vision of it which comes even closer to Tolkien's own. The special features are so many and so comprehensive that I can't imagine they'll have much else to offer years from now for a 10th or 25th anniversary editions. Jackson has done his homeland proud and has given fantasy fans the quintessential film all epics will be measured against for decades to come.